Logs alerts in a line based text format compatible to Snort's alert_fast format. Support more than just IPv4/IPv6 TCP/UDP. Definition at line 60 of file alert-fastlog.c. Definition at line 65 of file alert-fastlog.c. Definition at line 68 of file alert-fastlog.c. Definition at line 62 of file alert-fastlog.c. Definition at line 91 of file alert-fastlog.c. References Packet_::alerts, PacketAlerts_::cnt, FALSE, AlertFastLogThread_::file_ctx, TRUE, and LogFileCtx_::Write. Definition at line 103 of file alert-fastlog.c. References PacketAlert_::action, ACTION_DROP, PacketAlerts_::alerts, Packet_::alerts, Signature_::class_msg, PacketAlerts_::cnt, CreateTimeString(), Packet_::dp, EngineModeIsIPS(), GET_IPV4_DST_ADDR_PTR, GET_IPV4_SRC_ADDR_PTR, GET_IPV6_DST_ADDR, GET_IPV6_SRC_ADDR, GET_PKT_DATA, GET_PKT_LEN, Signature_::gid, Signature_::id, IP_GET_IPPROTO, known_proto, likely, MAX_FASTLOG_ALERT_SIZE, MAX_FASTLOG_BUFFER_SIZE, Signature_::msg, Packet_::pcap_cnt, PKT_IS_IPV4, PKT_IS_IPV6, PrintBufferData, PrintBufferRawLineHex(), PrintInet(), Signature_::prio, proto, Signature_::rev, PacketAlert_::s, SCProtoNameValid(), Packet_::sp, strlcpy(), TM_ECODE_OK, TRUE, Packet_::ts, and unlikely. Create a new LogFileCtx for "fast" output style. conf The configuration node for this output. A LogFileCtx pointer on success, NULL on failure. Definition at line 223 of file alert-fastlog.c. References PacketAlerts_::alerts, Packet_::alerts, Signature_::class_msg, PacketAlerts_::cnt, OutputInitResult_::ctx, OutputCtx_::data, DE_QUIET, DEFAULT_LOG_FILENAME, OutputCtx_::DeInit, DetectEngineCtxFree(), DetectEngineCtxInit(), DetectEngineThreadCtxDeinit(), DetectEngineThreadCtxInit(), DetectEngineCtx_::flags, LogFileFreeCtx(), LogFileNewCtx(), OutputInitResult_::ok, PacketAlert_::s, SCCalloc, SCClassConfGenerateValidDummyClassConfigFD01(), SCClassConfLoadClassficationConfigFile(), SCConfLogOpenGeneric(), SCFree, SCLogDebug, DetectEngineCtx_::sig_list, SigCleanSignatures(), SigGroupBuild(), SigGroupCleanup(), SigInit(), SigMatchSignatures(), unlikely, UTHBuildPacket(), and UTHFreePackets(). Definition at line 78 of file alert-fastlog.c. 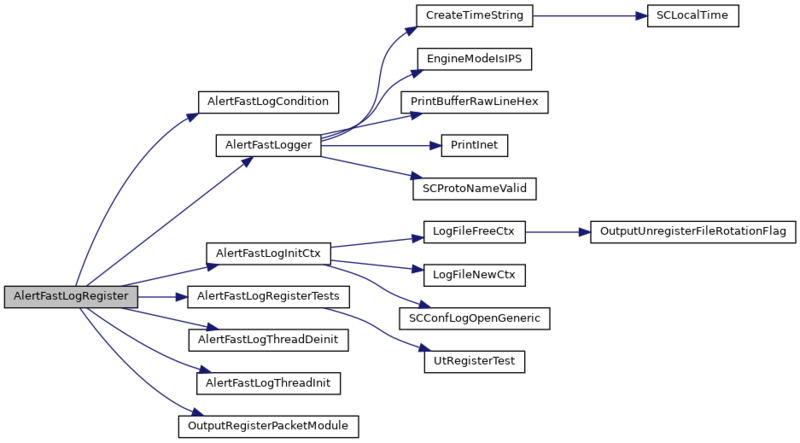 References AlertFastLogCondition(), AlertFastLogger(), AlertFastLogInitCtx(), AlertFastLogRegisterTests(), AlertFastLogThreadDeinit(), AlertFastLogThreadInit(), LOGGER_ALERT_FAST, MODULE_NAME, and OutputRegisterPacketModule(). This function registers unit tests for AlertFastLog API. Definition at line 357 of file alert-fastlog.c. Definition at line 204 of file alert-fastlog.c. Definition at line 185 of file alert-fastlog.c. References AlertFastLogThread_::file_ctx, SCFree, SCLogDebug, SCMalloc, TM_ECODE_FAILED, TM_ECODE_OK, and unlikely.